Used in all Performer EFI “wet” nitrous systems, the patented Edelbrock E1 nozzle is one of the most advanced in the industry. With its unique fuel passage design, this nozzle gives extremely high atomization. Machined from light-weight aluminum and anodized black for durability, the E1 nozzle allows the use of up to 60 lbs. of fuel pressure for a more complete combustion process resulting in more horsepower. Specially designed fuel outlets enhance atomization, even at lower fuel pressures. Multiple radiuses are used at the nitrous outlet to give the least amount of turbulence and a more precise nitrous spray. 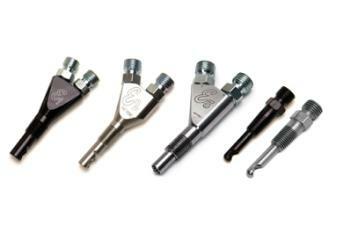 The stainless steel Edelbrock/Glidden E2 Nitrous Nozzles are used in Victor and Super Victor Direct Port nitrous kits and are capable of as much as 500+ horsepower gains in V8 engines using a single-stage direct-port injection system. This exclusive, patented Edelbrock/Glidden design precisely atomizes the nitrous and fuel mixture for consistent power gains with 5 to 20 lbs. of fuel pressure. The Titanium Direct Port E3 nozzles are the latest design for all out competition, producing the highest power output of any nozzle available. The “Straight-Shot” configuration and unique tip design produce excellent fuel atomization, and exclusive titanium construction makes this the lightest, strongest, and simply the best nozzle available. Used in all Performer EFI “dry” nitrous systems, the Edelbrock dry nitrous nozzle is one of the most advanced in the industry. The unique nitrous passage design gives extremely high atomization and is the key to the outstanding performance. Specially designed nitrous outlet enhances atomization.